My daughter asked me to paint a winged unicorn with a rainbow in the background for my granddaughter's bedroom. The unicorn had to be pink, her favorite color, and I had to embellish it with glitter. Lots of glitter. There couldn't be enough glitter! So, after I finished the painting, I gathered some glitter paint and had a whole lot of fun! When it was finished, I secreted the painting into their house, as it was a surprise. Her dad hung it above her bed and her mom brought her into the room. When she saw it, she screamed! That is how this particular 5 year old expresses her excitement. She loved it. 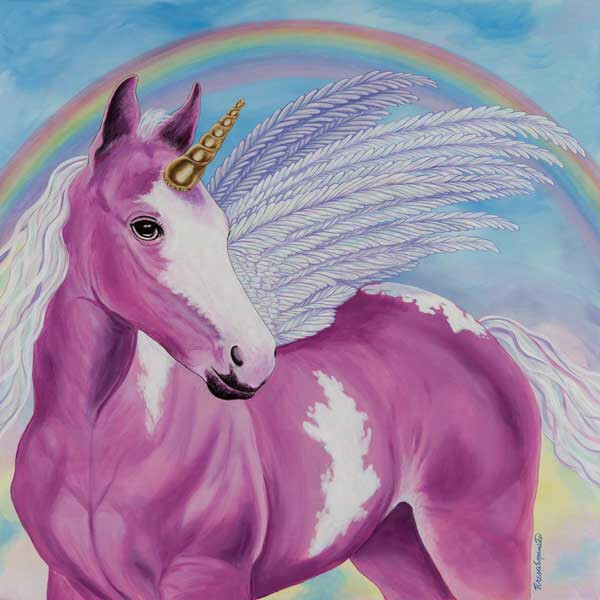 For those of you who like to do projects with young ones, you can embellish a print of Alana's Unicorn, too: Order a stretched or loose canvas print of Alana's Unicorn in whatever size you like (fine art paper, photo paper, and decals will not hold up to the extra paint). Use craft paint from Michael's or your local craft store. This is what I used, but you can try any brand/color: DecoArt Glamour Dust Ultrafine Glitter Paint in ice crystal and magenta, regular glitter paint (the glitter bits are larger) in gold and Craft Twinkles crystal, which is multi-colored, and Delta Ceramcoat pearl finish. All of these craft paints come in 2 oz bottles and cost 2-3 dollars each. The glitter is suspended in a clear base and dries clear. It won't flake off. The pearl paint will coat over the colors a bit, but the colors will still show through. This is how I used the glitter paint on my finished canvas: I painted over the unicorn's body with the magenta ultra-fine glitter, except for the white spots and face, which I painted with the ultra-fine ice crystal glitter. I used the Craft Twinkle crystal glitter on the mane and tail and also on the rainbow, which I then covered in the ultra-fine ice crystal glitter when the other coats were completely dry. I covered the unicorn's horn with the gold glitter. The wings were painted with the pearl paint and then coated with the ultra-fine crystal glitter. Always paint one coat at a time and let it dry before applying another coat. Have fun! This project is great for a young person's birthday party or a gathering of friends. 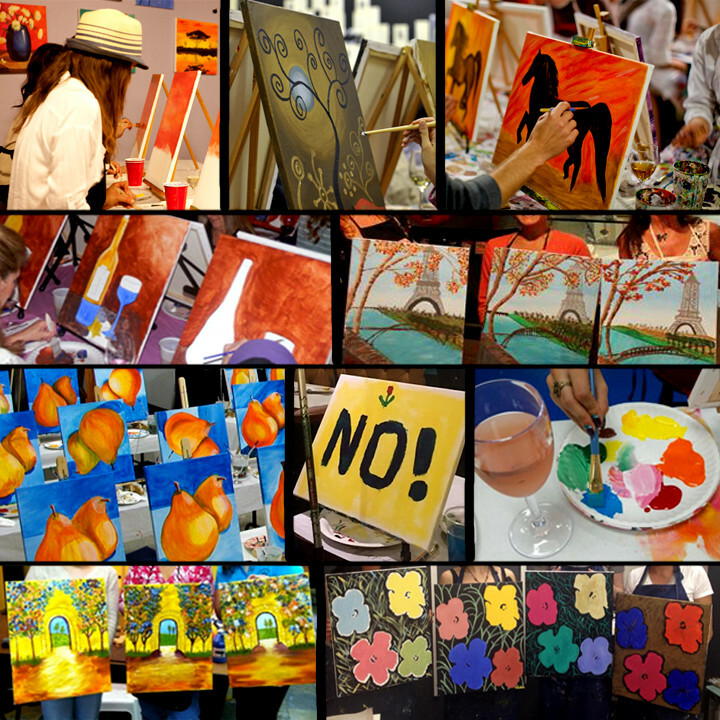 Each guest will have a piece of art to take home as a party favor! If you order 5 or more of these prints for a craft party, I am offering a 40% discount on loose or stretched canvas unicorn prints until the end of 2018. Just add the discount code UNICORN to your order! Or if there is some other painting from my website that you would like to embellish, give it a try! Order 5 or more for a craft party and add discount code UNICORN for the same 40% discount. 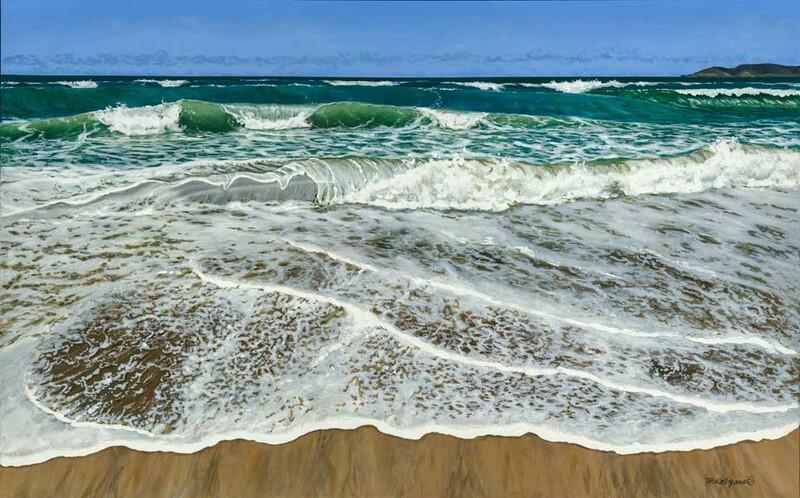 I love to paint water, specifically sea water, but sometimes I like to step away from the beach and head to the country. 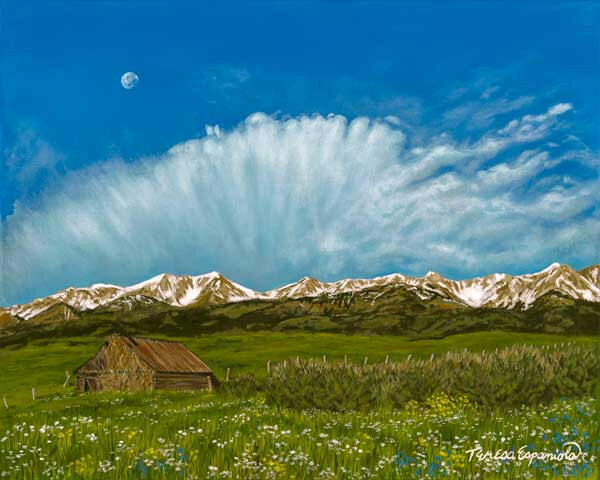 I love to be in Montana, where the skies are huge and the landscapes are beautiful. 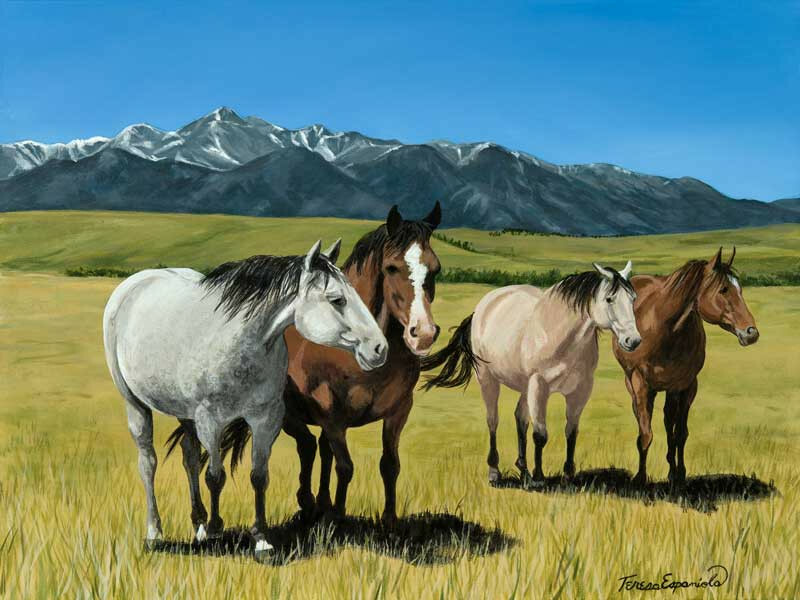 Montana is ranch country and there are a lot of horses spending their lives grazing the hillsides below mountain ranges. 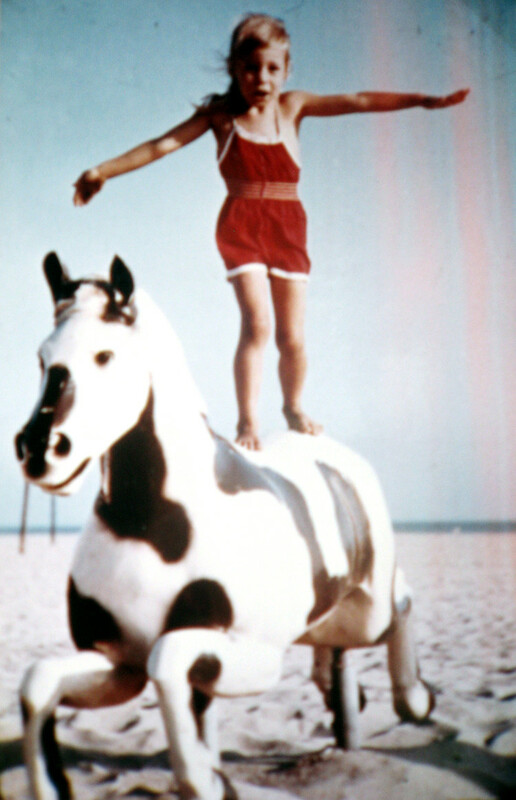 As a child, like many little girls, I dreamed of owning a horse. That is the only thing I ever wanted on my birthday or holiday, a horse of my very own. Living in the suburbs of California, it was never going to happen. I got to live the dream as a kid by riding with my friends who had horses and then really live the dream in Hawaii where I cherished a few horses of my own. Dream fulfilled. 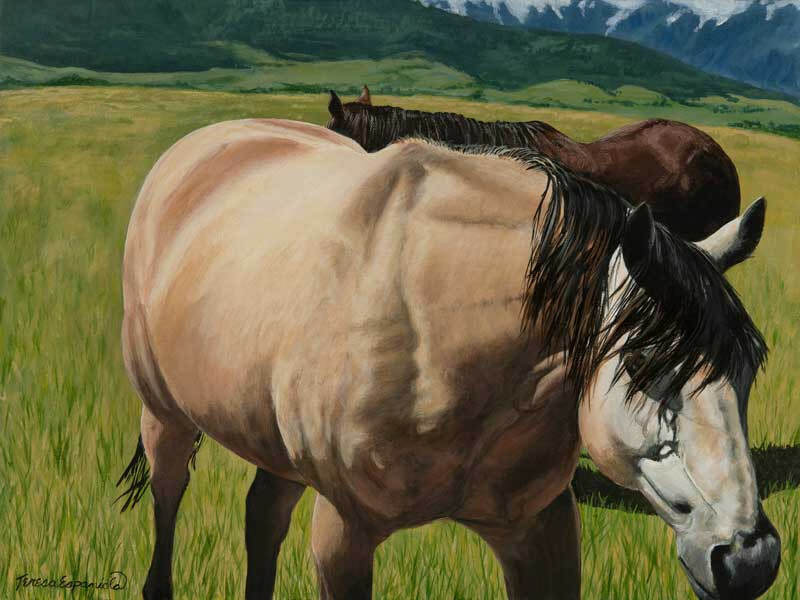 In Montana, they make owning a horse look pretty easy, with all of the pasture land and big barns scattered over the countryside, wooden fences rolling along for miles and miles. Here is a horse, moving slowly while grazing on a lazy afternoon. I know a special young girl who is certainly living her horse-riding dreams. This painting is for my goddaughter Maile. She is an amazing rider who is dreaming of a horse of her own. She is in the right spot: Montana. Water sure does provide us with opportunities for fun. Whether in pools, lakes, rivers or oceans, there are many ways to play in water. You can even find ways to enjoy it without getting wet, such as yachting or cruising. 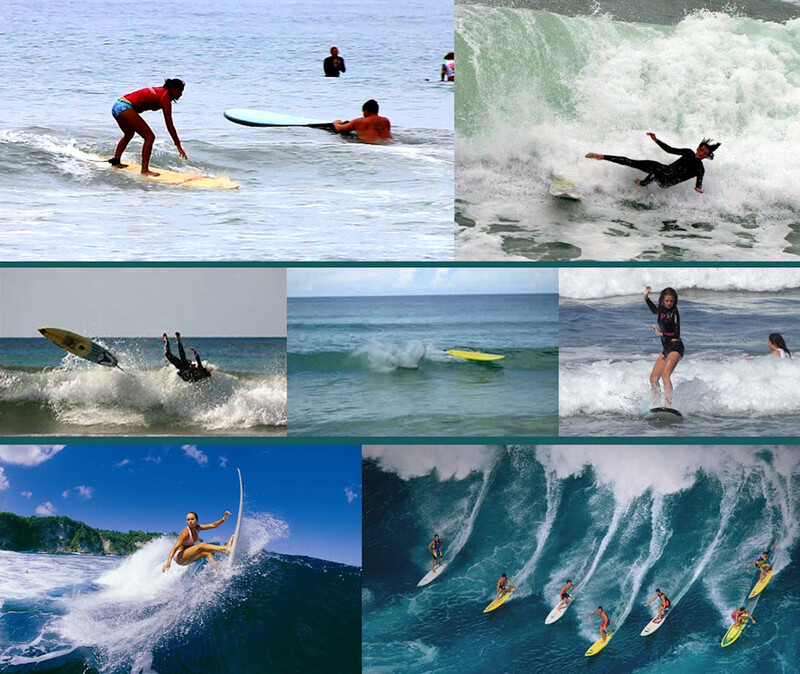 There are some sports that you can (mostly) only do in the ocean, such as surfing. 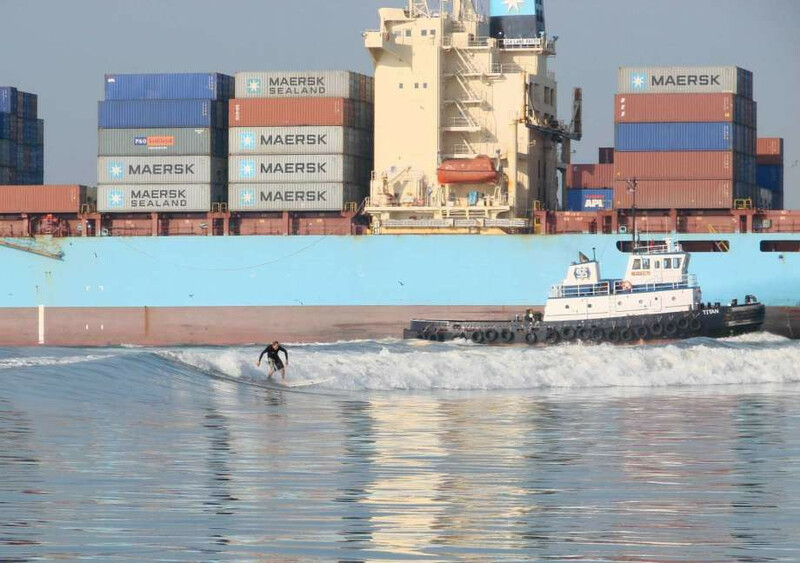 Yes, there are some lakes and tidal rivers and huge tanker wakes that have given surfers some good rides, and even superb wave pools, such as those Kelly Slater has built. Wohoo! The ocean is usually our only surf instructor and the most important lesson is in learning how to read the water. Where is the lineup? Is that wave going to break on my head? Will the current pull me into the impact zone? Can I catch this wave before it tosses me over the falls? Is that a huge set on the horizon? The reward for doing your homework is magical, fun and so wonderful, but you usually end up with some scars to show from your schooling! Road trips can be a fun way to take a side road to view the sights. 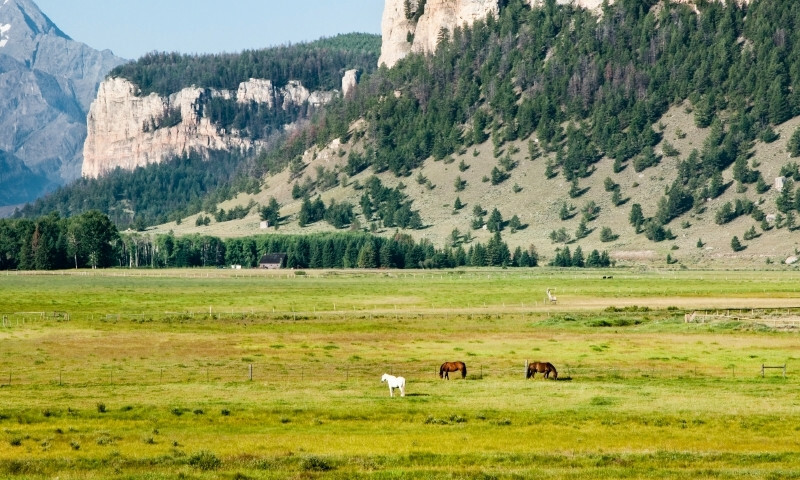 Driving east from the small town of Red Lodge in Montana, you may find a lovely winding road that meanders through beautiful ranch lands. 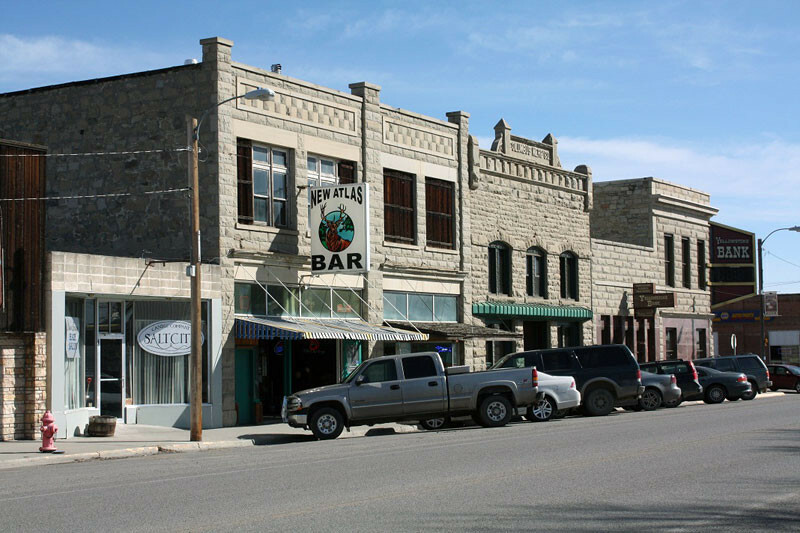 This road eventually leads you down through even smaller country towns, each with one or two blocks of main street brick buildings; a family hardware store, grocery, church, bakery and bar. The sweet neighborhoods are filled with older wooden houses standing together like a herd of horses in the shade of huge cottonwood trees. Freshly mowed lawns and bright flowers growing in gardens show us how all Montanans take full advantage of the warmer weather. Once out on the highway again, there are more open spaces and ranches to gaze at over the miles. Your eyes never stop moving over the beauty. Along that lovely winding road, there were many spots where horses gathered in the sunshine to keep each other company after an afternoon of grazing. Standing under the huge blue sky, they made a picture of serenity, resting beside good friends. There is something about a pile of dinghies sitting on a beach or tied to a dock that triggers a smile. Sitting out in the bay beyond these little beached or docked boats, which come in many shapes and sizes, are their larger companion sailboats and yachts, moored to buoys in neat rows. These neat rows are certainly not present on the beach or the docks, oh no. Our little transporters are mostly piled and crowded together, vying for a spot closest to the open water for an easy take-off. They have sand and dirt in their hulls and sometimes a bailer or two of dirty salt water. Ropes are tangled on peeling benches or slopped over the sides onto the sand. For me, this is what gives them their charm. 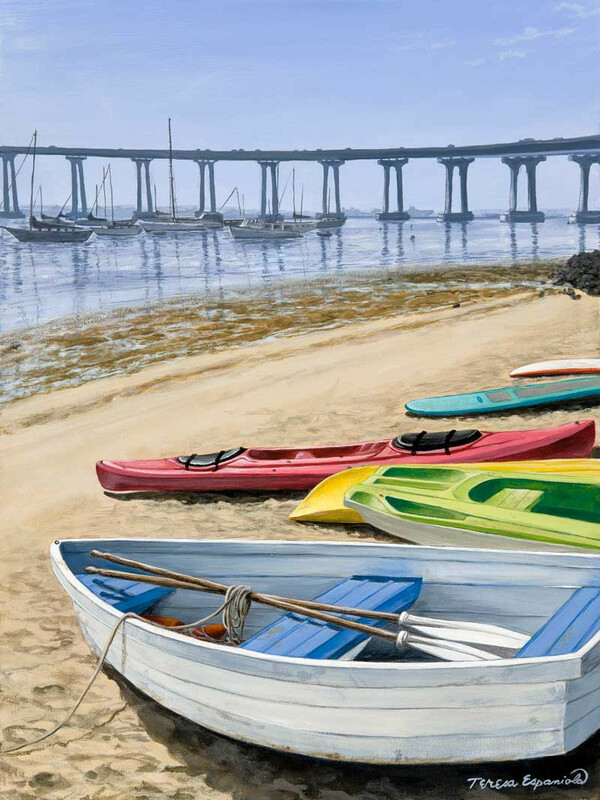 Add a bridge in the background and you have cause for a painting! 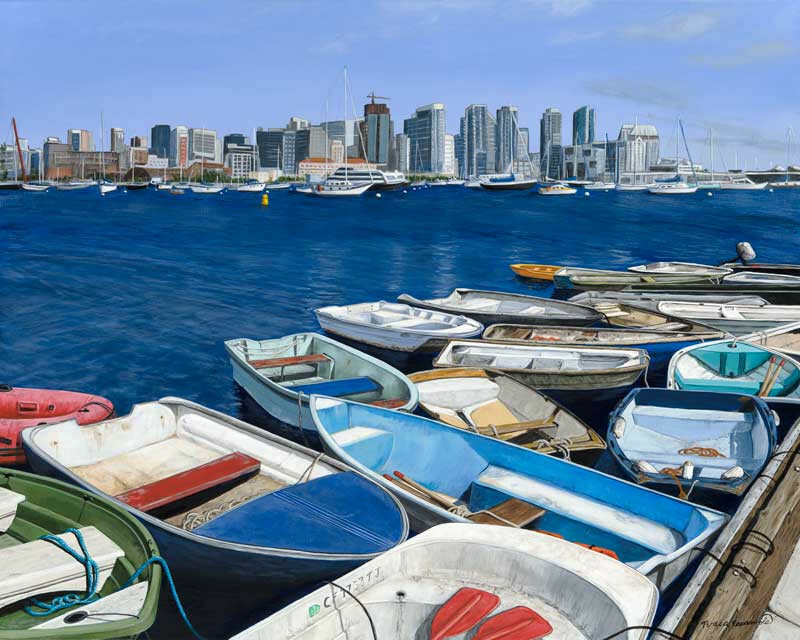 I go in search of colorful little boats to paint. I find a lot of them here in Coronado and across the bridge in San Diego. As I add paint to canvas, I think about the life of these little wooden or plastic molded boats. They have an important job! Nobody is going to sail their lovely sailboats without these rusty buckets who dutifully perform their semi-boring job year after year. Back and forth, back and forth. Though some are pretty neat and tidy with little motors, most are kind of beat up with dirty rags and empty cans sitting in them, old sun-bleached life jackets shoved under benches. Paint is flaking off wooden sides and some are rotting a little bit. Beautiful! Those are the steady, loyal subjects I seek. The Republic of Fiji is nestled in the midst of the island groups of Vanuatu, New Caledonia, Samoa, Tonga, Tuvalu, Tokelau, Cook and the Solomons in the South Pacific Ocean. Fiji is comprised of over 300 plus islands and more than 500 islets, some of which you could circle on foot or swim around in a few minutes or less. 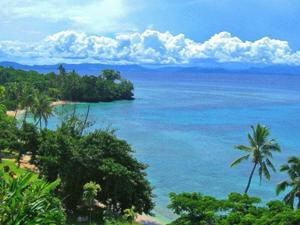 The main islands of Viti Levu and Vanua Levu are home to 85%-90% of Fiji's 912,000 inhabitants, leaving the rest to spread out among those 300 plus islands. Actually, most of those islands are unpopulated for one reason or another, including isolation and lack of fresh water. 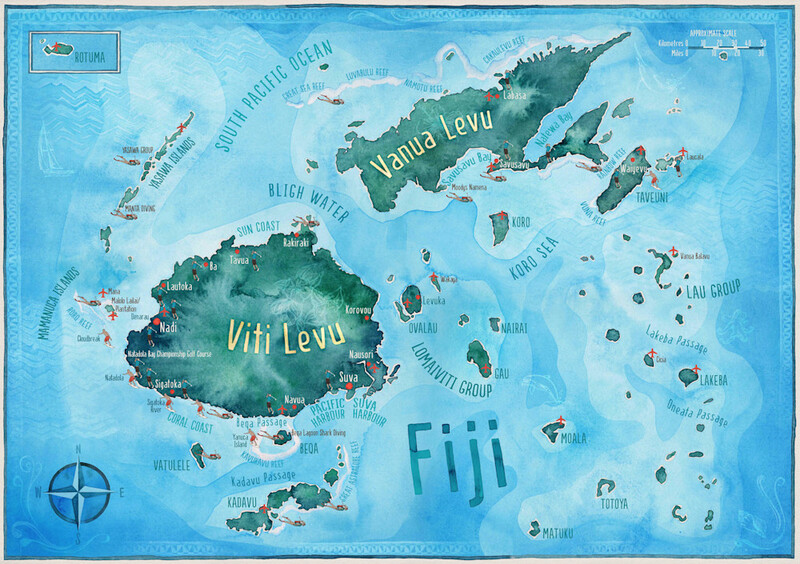 Shaped like a footprint, Taveuni is the third largest of the Fiji islands and is easily accessed from Viti Levu and Vanua Levu and home to about 19,000 of Fiji's residents. It is here that I have enjoyed the beauty of these islands the most. 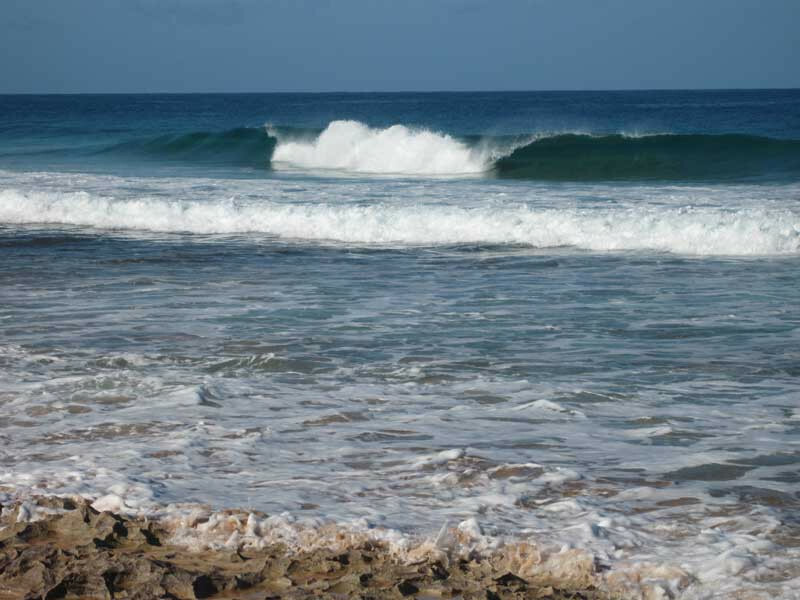 Picture coconut trees and sandy shores opening to colorful reefs which beckon you to skim over them with mask and fins. 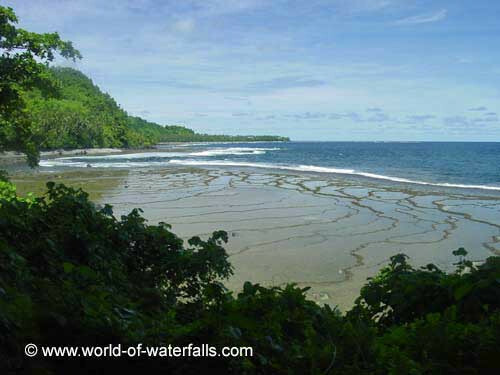 Waterfalls and rivers flow to the sea from volcano-made peaks covered in impenetrable jungle. Imagine amazing views of barrier reefs, sailboats, islands and the many islets that dot the waters. Scuba diving from Taveuni in the Somosomo Strait is world famous for its rare creatures that are found hiding in colorful corals. Huge anemones are large enough to cover your living room floor, a lush carpet complete with clownfish nipping at your feet. Giant clams hide in plain sight in the coral beds, surprisingly camouflaged by the colorful clam inside. There are, of course, those creatures to keep an eye on; Lion Fish with those poisonous spines that resemble graceful angelic wing-fins. Lovely black and white banded sea snakes that could end your dive in seconds with one bite - (that is, if you could stick your tiny pinky finger back into their tiny mouth). Otherwise, they may just want to snuggle around your middle for warmth... A few other creatures to watch our for: https://www.fijimarinas.com/dangers-of-sea/. The chances are slim that a dive would be anything but wonderful. There is a path that hugs the shore from the village of Lavena, which sits in the Northern Division at the end of Taveuni's drivable roads. This path leads to the Wainibau waterfalls after a hike through bush and stream, past huts and domestic pigs tied to coconut trees. Tall stately Fijian men wearing sulus and holding large machetes might pass you on the path, a friendly 'Bula!" and a smile in greeting. Kava is planted in the midst of jungle above the hillsides. The view from this path is framed by foliage that grows thickly along either side, creating lovely windows of gorgeous tropical ocean views. If you would love to spend some island time on Taveuni, Makaira is a warm and welcoming three 'bure' (guest house) resort overlooking the Somosomo Strait. You can experience snorkel tours or learn to plant and maintain a coral reef garden with Roberta or go angling for a fresh fish dinner caught by you and prepared by John. Tell Roberta and John that Teresa sent you. See this YouTube video for a visual tour. Mother's Day is over, Father's Day is Next! Tomorrow would have been my Father's 96th birthday. He has only been gone since December 30th of last year. Though sad he is gone, I am glad he is free from Alzheimers and the restrictions of his body. As Father's Day approaches, memories of my father flow through my mind, coming and going like the foamy shore break of the sea. My father loved the ocean. He would drive his 4 children to the beach to play in the water, swing on the swings and run on the sand. He would also have us collect rocks to line the garden with. We liked the first option better! When I was just a small girl of 6 or 7, he would take me fishing with him off of the floating docks in San Diego. My grandfather would come along and the three of us would catch supper. I was so little that when I hooked a fish (plentiful in those days), I was afraid it would pull me into the water, so my dad would help me real it in. We also went on charter boat fishing trips, me being the only kid on the boat. I remember the fisherman in a wheelchair who would give me his catch. My dad started taking me with him after my older brother passed away. I was happy to go and keep him company. I don't know about anyone else, but when I was growing up, I thought everyone's dad was like mine. I thought everyone got to go up in small airplanes to look at the Christmas lights or fly to see family in other cities. Or pack 6 into a 4 passenger plane and fly to Mexico for summer vacation. My dad could also fix anything around the house, show movies in our living room for all the kids on the block and create tiled art out of abalone shells. What are some fond memories of your father? Remembering my dad, James Allan Thomas, this Father's Day. 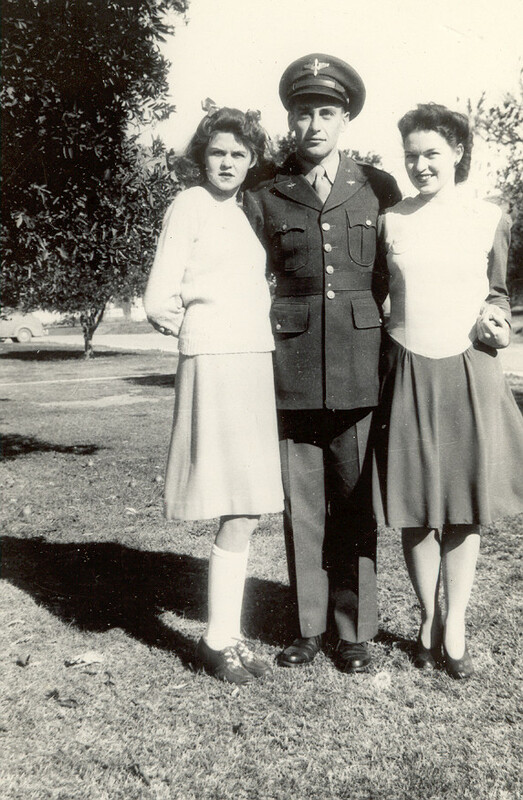 Here he is, looking pretty cool in his military uniform, standing with his sisters. Perhaps your father would enjoy one of my art prints. Look at the gallery page on my website to see if there is one just for him. Need some information about choosing a print medium ? Check out my previous blog on the many choices. 40% Off Mother's Day Sale Still Going On! 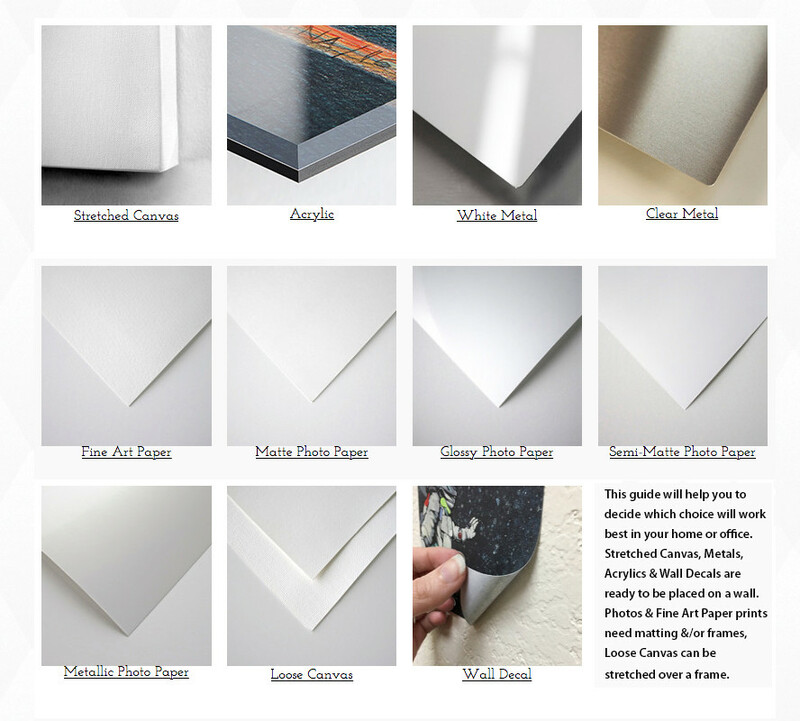 Fine Art Paper is good for matting and framing and will go well with other framed prints in your home. Canvas, either loose or stretched, is also a good choice. No framing or glass needed and canvas is sturdy. If you buy loose canvas, you can stretch it yourself or have it stretched or you can use a dowel to hang it from. Canvas is light, easy to hang and care for. Metal comes in white or clear. The difference is that the white will print with a bit more color saturation. The clear metal shows the clear metal background more, but both have luminosity, as metal reflects light well. These are sturdy, lightweight and ready to hang. Acrylic has a 1/4 inch acrylic overcoat which gives each piece vibrancy. These prints have a sturdy back panel and are ready to hang. Photo paper is pretty straight forward and comes in matte, glossy or metallic. Frames will be needed. Decals are easy to place right on the wall and can be moved around. Bigger prints will come in panels that overlap to cover a larger wall. All medium options on the gallery page will give you more information when you select them and hold your cursor over the small dark dot. Don't forget to try the wall preview option to see how the size and color of your choice can look against several wall colors and furnished rooms! I appreciate your support, and thanks for reading my blog! I'm not much of an ordinary fish in the sea. Yes, an adult Sheepshead Wrasse is not a pretty sight, but this fish plays a very important role in the ecology of its California kelp forrest home. Those ugly and sometimes buck teeth of his? They do the work of a steel trap and grinder, keeping the kelp-eating sea urchin population at bay, which helps boost coastal kelp growth rates. (Yes, I did I say 'his buck teeth', because an adult Sheepshead is male, even though he starts his life as a female. This gender change occurs gradually and usually sets when the fish reaches about 1.5 feet in length. Then he can continue to grow up to 3 feet in length and weigh up to 35 lbs! If he were human, he could live long enough to finish high school plus attend a few years of college! That's a lot of time to pack away many pounds of sea urchins, crabs, barnacles, mollusks, lobsters and other aquatic invertebrates - just like a young, hard-working and still-growing healthy human high school or college student. Unlike any young hard-working healthy human student, Sheepshead Wrasse are subject to pole and hook fishing, spear fishing, and commercial aquarium suppliers. They also may end up on a plate, often acquired from, but not limited to, Asian markets and restaurants. Minimum catch rules are in place for this valuable wrasse for commercial and recreational bag limits, as they play such a vital role for helping kelp beds and other kelp dwellers have a chance at longer life spans. Why did I paint this goofy looking fish? I actually think Ned is rather cute and I wanted to introduce you to him and a to a few other kelp forrest dwellers, including Garibaldi fish, juvenile Sheepshead Wrasse, urchins and starfish. 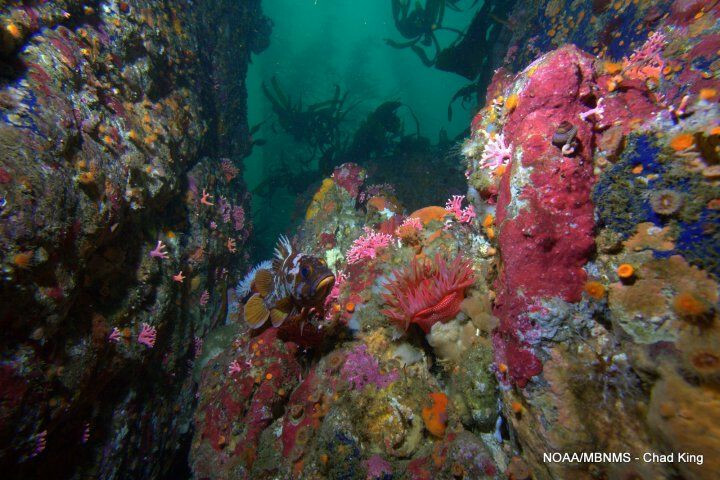 Also, I do love color, and a kelp bed can be a very colorful place, as evident in this photo by Chad King. Thanks to my friend Tim for naming Ned. It fits! Thanks for reading my blog! I love color! Art doesn’t have to be about color, but like many artists, it plays a big roll in my artwork. I am drawn to the colors of the sea. There are many different shades that describe the ocean’s varied moods. Blues and greens remind me of tropical oceans. I can’t get enough of them. Turquoise calls to me like a distant spot of sand between reefs in the sunlight. And yet, there are times when it seems that there are not enough colors to choose from when I have a new canvas before me. I mix and blend my paints and have a variety of colors in an array of tubes, yet it feels like there should be even more colors available. Does anyone else feel this way? Research tells us that, (depending on the source), the human eye can see anywhere from 100,000 to 2.3 million colors. It’s all about the wavelengths of light reflected off of a surface and how the rods and cones in our eyes – of which we have about 6-7 million – interpret this light. Our rods and cones are concentrated in a spot on the retina called the fovea centralis. They see mostly reds, then greens and lastly, blues, all of which can be translated by our brains into other colors, such as oranges, purples and yellows. Here is a fun website about color: http://www.colormatters.com/color-and-vision/color-and-vision-matters (it even mentions red contact lenses for chickens - I kid you not!). May you enjoy soaking in all the colors that call to you. 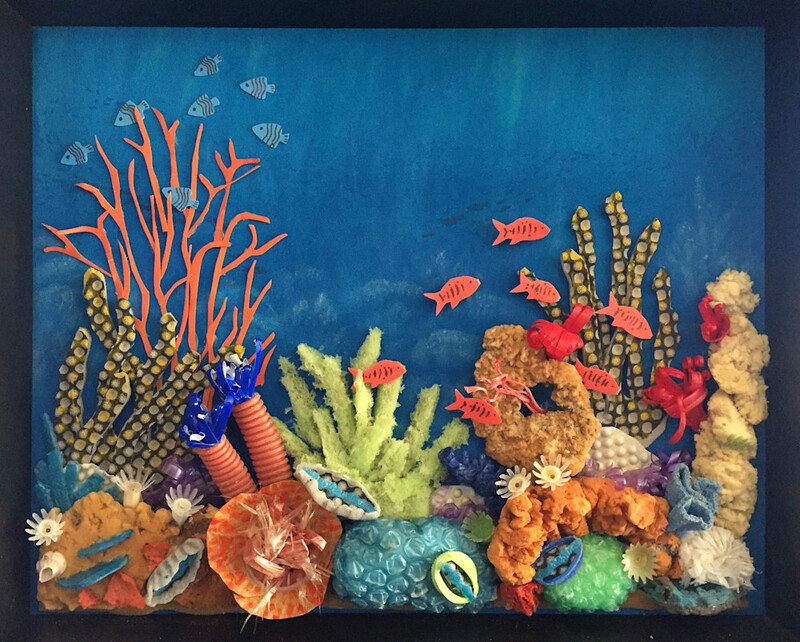 If you have read my earlier blogs, you know that sometimes I have opportunities to teach children about the ocean through art. Using beach trash and recycled plastics, I create ocean-themed artwork - a whale, a wave, a reef, etc - and the kids have a hand in making it as they learn about the state of the oceans. Colorful corals have taken hundreds and thousands of years to grow. They occur all over our little blue planet's ocean. 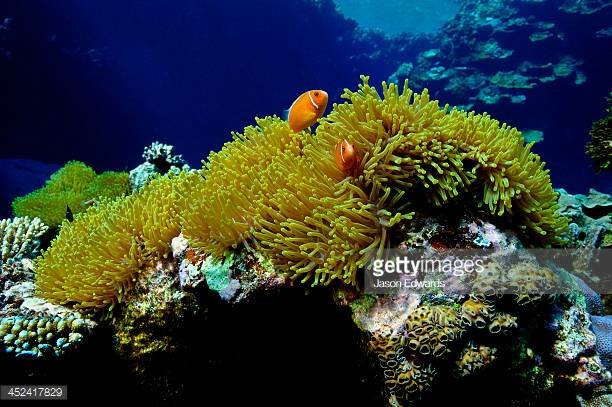 There are millions of species that live in and around coral reefs with many undiscovered reef dwellers yet to be named. Snorkeling or diving among coral reefs is one of the great pleasures of life. Encountering creatures that live among the corals is a thrilling experience, especially if they decide to interact with you. We do not yet understand the level of intelligence of our ocean-dwelling friends, yet we get an inkling when they show themselves to us. The painting above is of two outrigger canoes at rest on a beach at sunset, one of my ocean dreams. According to Wikipedia, outrigger canoes were originally developed by the people of the Southeast Asian Islands for ocean travel. Outrigger canoes are used worldwide, from Africa, Sri Lanka, the Philippines, New Zealand, Micronesia, Melanesia, Taiwan, Indonesia, Polynesia and more. A person can attach one or two outriggers to a single hull for stability or add more room for paddlers/passengers by using two hulls in a double-hull configuration. A true history of the outrigger canoe is unknown, as recorded history doesn't go back far enough. A first encounter of an outrigger canoe in the Mariana Islands by one of Magellan's ships in 1521 reported the speed and agility of this sailing canoe, most likely with a touch of admiration and envy. According to at least one website, Hawaiian Paddle Sport, outrigger canoes arrived in Hawaii around 200 AD from Tahiti. Outrigger canoes are a very big part of the Hawaiian culture, so it is easy to believe that they have been in use for a very long time. The double-hulled sailing canoe, Hokule'a, built in the 1970's as a replica of ancient Hawaiian sailing canoes, set out to retrace the voyage from Tahiti to Hawaii, where the people of Hawaii are said to have originated from. 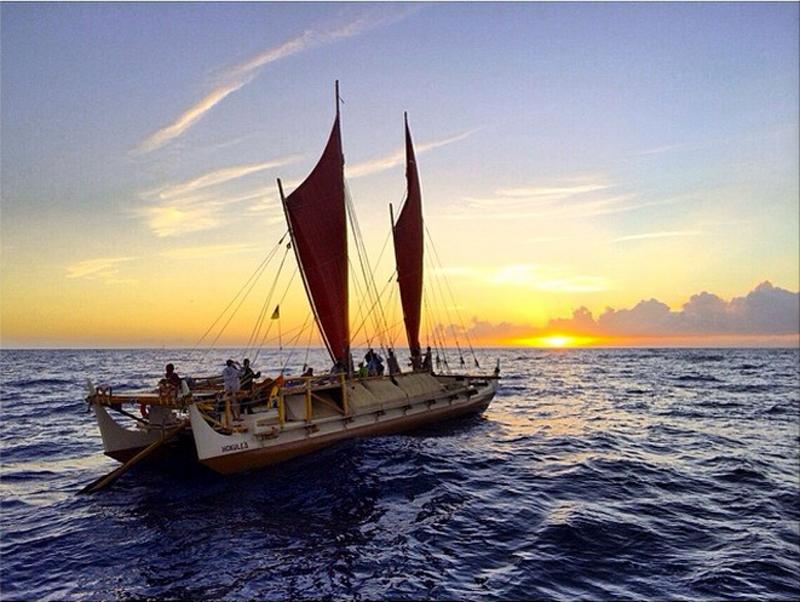 Since that first Tahiti voyage in 1976, Hokule'a has sailed to many places and continues to do so. I watched Hokule'a sail out of Maui for that first Tahitian voyage -- I was excited! Years later, I sailed on the Hokule'a from Molokai to Oahu and again from Kawaihae to Maalaea Harbor, two adventures I shall always cherish. 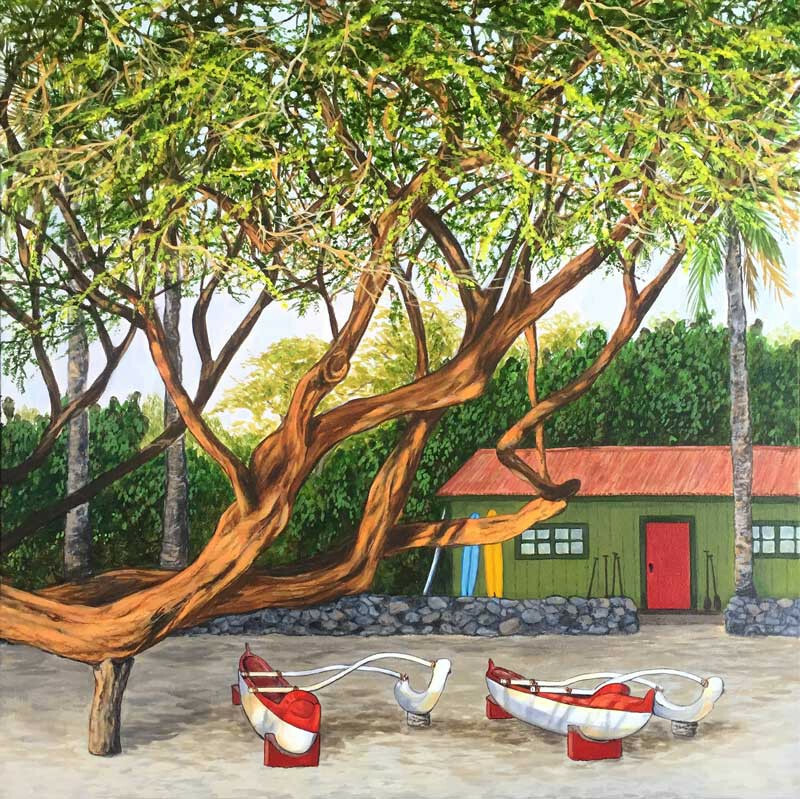 My introduction to outrigger canoe racing began in the early 1980's when I joined a team of women paddlers on the island of Molokai. I paddled with Molokai Canoe Club for two years, competing in regattas and inter-island races. Molokai Canoe Club participated in the Na Wahine O Ke Kai outrigger canoe race from Molokai to Oahu twice while I was on the team, in 1981 and 1982. Since then, I am sure the ladies of Molokai canoe club have paddled this challenging race many times. Hi Friends, are you enoying summer? Due to travel, I haven't posted a blog for several weeks but now I'm back again! There is something about a tropical ocean scene that calls to many of us. 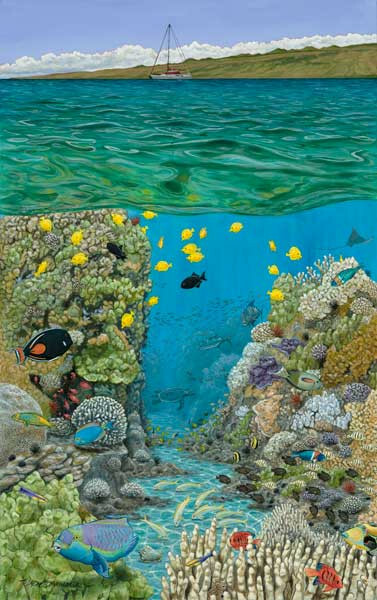 The color of the shallow sea over a reef in the sunlight soothes the soul. Turquoise water dances while shades of blue and green reflect the sky and coconut trees. Did I mention coconut trees? Yes I did. The fronds rustle in the wind, and with the soft sounds of the ocean, the scene is set. Is there a more relaxing place to spend some time? For me, this is it. Of course, jumping into the water and checking out the reef with a mask and fins are always included in my tropical ocean dream. Some kind of water transportation is nice, too. There is so much reef to explore! Anyway, I decided to paint a few of the places that I love, blending them into my dream of paradise. I love plantation houses from another era. 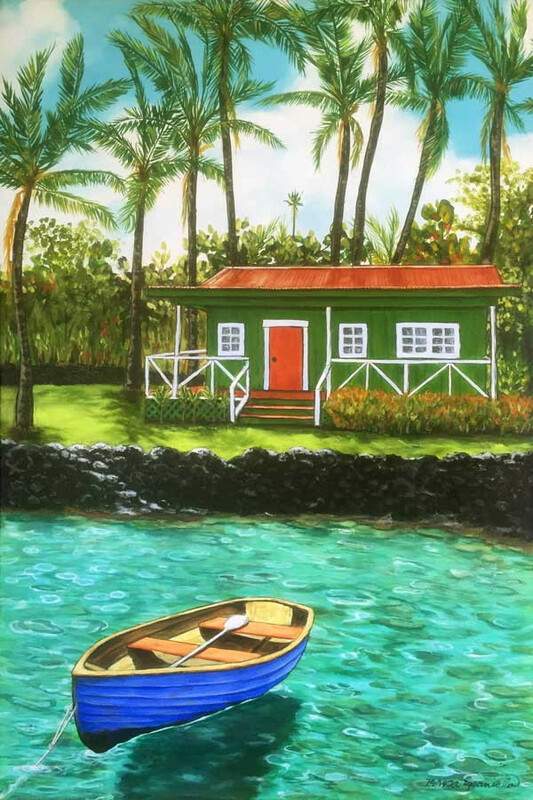 They are almost always painted a shade of green with a rusty red colored roof and white trim and are usually built above the ground a foot or so, with a nice lanai to relax on. 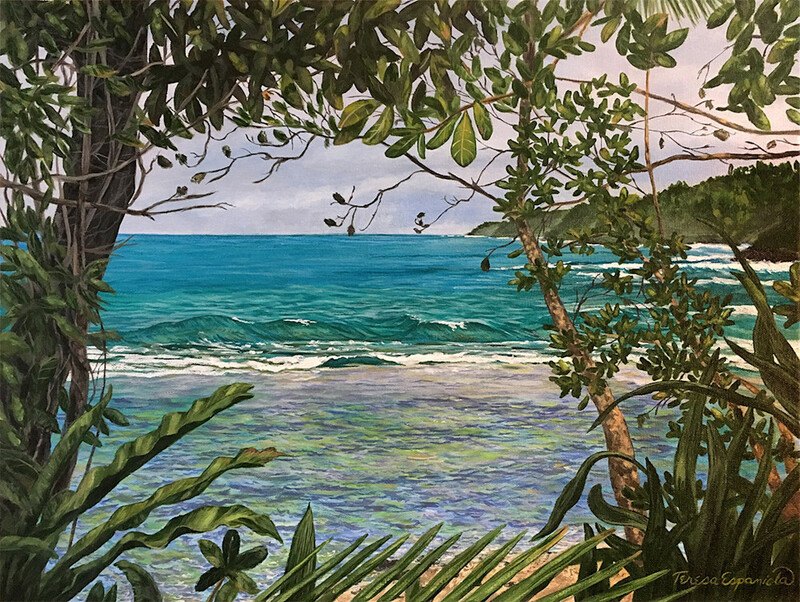 Painting the ocean is something I love to do, but painting a tropical ocean scene really puts me right there in my dream of paradise. What is your dream of paradise? When walking on an empty beach, thoughts turn inward and feet merge with wet sand and foamy shore. If alone, there is no one else to consider and no words that need to be spoken. A simple nod to anyone you might pass is enough to include them and yet remain in solitude. It is a time to ponder a new project or a difficulty, as walking with the sound of waves provides a nice opportunity for new perspectives. When I paint an empty seascape or landscape, it is to capture this place of solitude, recording it for myself so that I can step into it in future. When the original sells, my goal is to give the new owner a space to be in, too. There are many articles and studies about the benefits of solitude. Sherrie Bourg Carter Psy.D. tells us that solitude allows us to reboot our brains, improve our concentration, enhance our relationships, help us to solve problems, and help us find our own voice. Who knew? Don't get me wrong, I love to be with people, too, but I need quiet time alone. How about you? I know that there are many lovely places for a person to enjoy nature, feel the earth beneath their feet, and grab some solitude. Please share your favorite places with me, I would love to hear how they give you what you need. 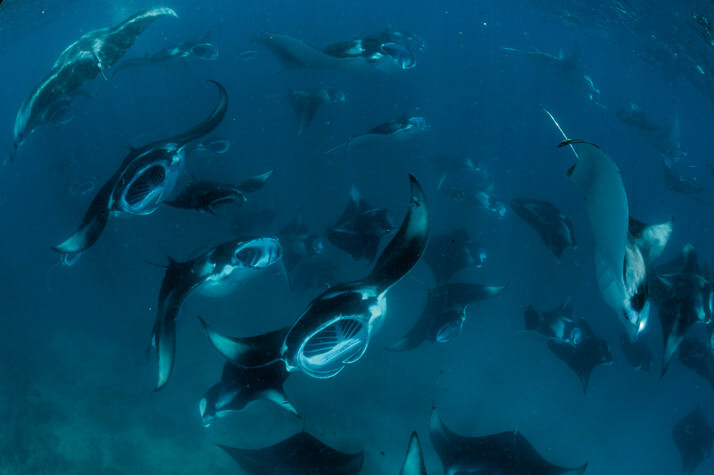 Have you ever witnessed the graceful dance of manta rays feeding together in a large group? These plankton eaters move with choreographed twists and turns, large mouths agape to filter out their nourishment from the seawater. Their 'winged' bodies turn together in 'high fives' as they greet each other coming from opposite directions. As I watched this dance while snorkeling alone along the west shores of Hawaii, I began to imagine myself as a manta ray and quietly immersed myself into the school. I wondered if the rays would 'high five' me as I swam within their midst. Slowly swimming towards a ray that was moving towards me, I reached out my arm as I turned, thrilled to have the ray do the same with its triangular pectoral fin. Over and over, I learned the dance of the rays as the afternoon light waned. I stayed with the school until I my teeth chattered, amazed and humbled by their acceptance of my presence in their world. Manta rays have the largest brain of all known fish species. Filter feeding on mostly zooplankton by swimming open-mouthed, small fish seem to know how to avoid becoming part of the meal while feeding on the same zooplankton. Schools of manta rays gather when the food is plentiful in tropical and subtropical waters of the Indian, Pacific, and Atlantic oceans. Manta rays can be as large as 23 feet across with a weight up to almost 3,000 lbs! (The rays I swam with had a wingspan of about 5-6 feet.) Their tails do not have a stinger on them like their cousins the stingray. Manta Rays will migrate for food and toward warmer waters. With a white belly and gray-black back, they are difficult to see from above or below, where predators might be roaming. Though said to feed mostly at night, they will feed when the opportunity presents itself, day or night. I searched for a video that showed manta rays feeding, hoping to find them performing the dance I described earlier. Though I found many videos, most of them showed the rays 'barrel rolling' in deeper water than when I swam with them. Perhaps the shallower water brought on the 'high five' ballet that I experienced. All I know is that it was a magical experience that I cherish and for which I am grateful. 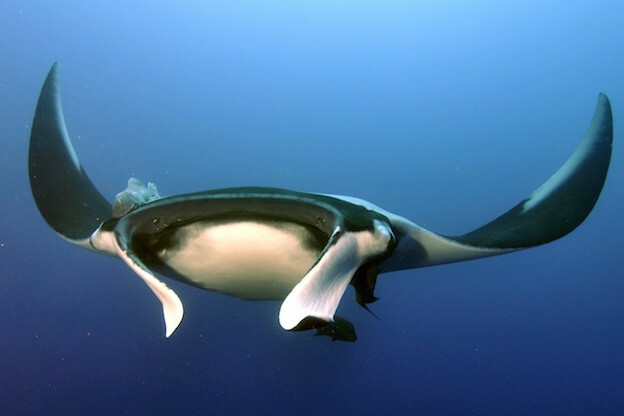 Here are some facts about Manta Rays and videos of large Mantas feeding in shallow and deep waters. Imagine sitting in a kayak in deep water a half mile off the shores of Hawaii. The ocean's surface is as smooth as silk, unruffled by wind. It is Humpback Whale season, a time when the whales migrate to warmer waters to give birth or find a mate. For weeks you have seen the whales slapping fins and tails on the surface and breaching almost completely out of the water. But on this day, they are nowhere to be seen, even though you can see for miles in any direction from your kayak. Only slightly disappointed, you decide to put on your mask and fins and dive into the depths to watch the light rays travel deep into the water. As you descend, suddenly you hear a whale symphony broadcast in surround sound! The whale song is so loud, you can feel it move through your body. You continue to dive and soak in the salty concert, knowing you will remember this moment forever. Humpback Whale songs have been recorded for decades. Scientists have found that these whale songs change every year by comparing annual recordings of whales when they return to their winter residence, in this case, Hawaii. 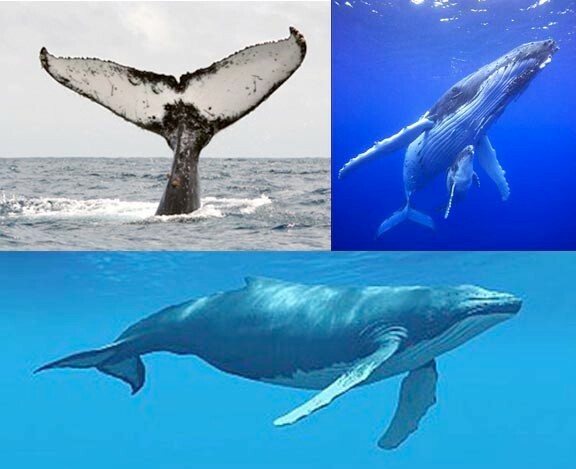 The songs have been recorded from many different whales, who sing the same tune as their traveling companions. Although it was thought that only male whales sing, we now know otherwise. My friend Nan Woodman witnessed a female Humpback Whale sing while building a bubble net for the pod. Nan saw the bubble net during a scientific study she participated in off the coast of Alaska. The event was also captured on film (see humpbacks building a bubble net here). That must have been amazing! Why does sound travel so well in the ocean? Ocean depth, pressure and temperature all play a role in carrying sound waves through the oceans, sometimes for thousands of miles. Hear whale sounds at National Geographic here. Or see whales swimming and singing courtesy of the Whale Trust Maui here. 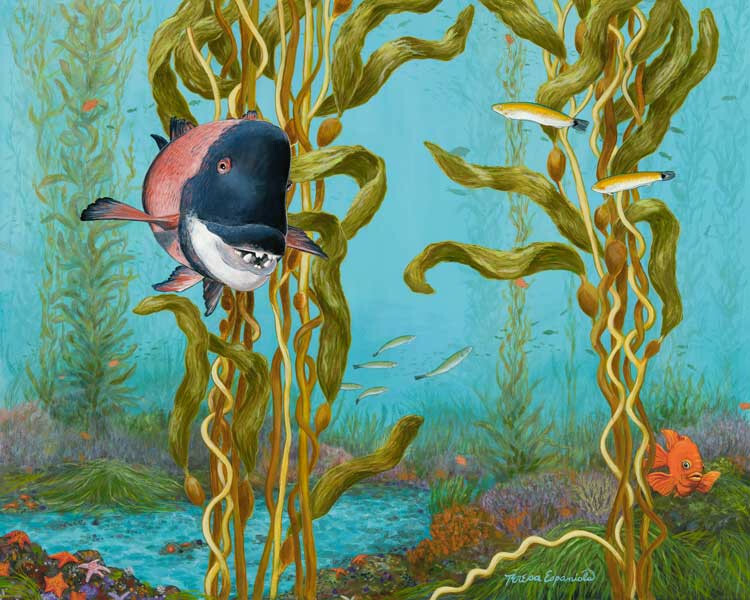 Learn about the science of sound in water from NOAA or from Discovery of Sound in the Sea. Hearing the whales that day in Hawaii with a few of my friends was fantastic; I will remember it forever. What a gift! Some people are there to create a painting to take home. Some people are there to drink wine with their friends, and as a bonus, create a painting. Some people are there to drink wine. Some people follow the instructor with every brush stroke. Some people break the rules from the get-go, which is expected and encouraged by the instructor. Mixing paint classes with alcoholic beverages makes for a fun time. If you haven't attended one of these classes, here is one example of what to expect: Classes run for 2 -3 hours. The instructor provides a visual of the painting-to-be and walks attendees through the process. Subjects for the paintings are usually simple, as some attendees have never picked up a paint brush before. Supplies consist of fliud acrylic paint in a limited variety of colors which are distributed in a paint tray or on a paper plate. The palette, for holding and mixing your colors, is usually a paper plate as well. Each participant is given the above along with 3 or 4 brushes in as many sizes, a cup of water and paper towels to clean and wipe brushes, and an apron to wear over your clothes. Oh, and don't forget the wine! If you have attended these classes before, did you enjoy them? Did you like the subject of the painting and the instructor? Please share your experiences, as I would like teach this type of painting classe and would love to hear your thoughts. Thanks! For those of us who love the sea and are fortunate enough to live near the shoreline, we can easily get our 'fix' when we need it. For those who love the ocean but live far away, there is a certain amount of planning involved in order to get your feet sandy and wet. This planning may include coordinating vacation days with others and double-checking the budget. Sometimes tickets need to be purchased several months in advance, depending on the distance and popularity of your chosen destination. Hotels or AirBnB rooms need researching and securing. Water toys need gathering. Packing sunscreen and swimsuits are on the list. If you are traveling with kids, triple all of the above. Breathing the sea air is vitalizing: it's full of negative ions, which help us absorb more oxygen. Hearing the sound of the waves relaxes the mind and body. Watching the waves roll onto the shore is also very relaxing. Swimming and playing in the sea helps you (and the kids) get a good night's rest. Walking on the beach quiets the mind. Being in sunshine lightens one's mood, but don't overdo it -- sunburn is no fun. Read more about the healing power of the ocean here. If you longed to be by the sea this Memorial Day weekend but couldn't manage it, here is a 24 minute video I created that might induce some relaxation. You can let the video run in the background and still hear the waves role in. If you do watch it, look for the dolphins at the 15 minute mark. And enjoy the sun setting over the sea. It's an understatement to say that seashells make me smile. Seashells are nature's artwork, geometrically perfect and beautifully colored. 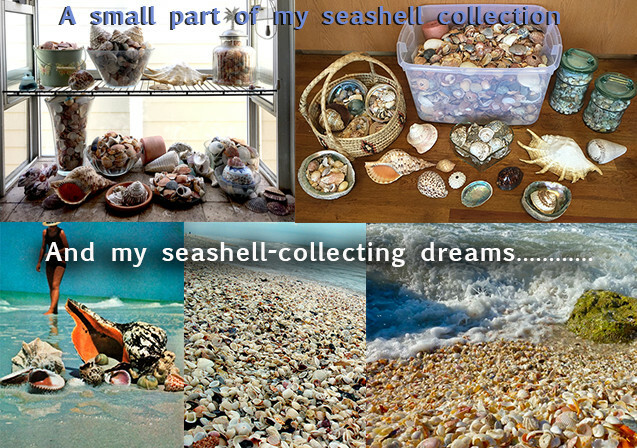 Others collect art; I collect seashells. My heart sings when I find them while walking on the beach or when I'm snorkeling. I don't take them if someone is living in them, but if they are empty, they are mine! Scientists don't really know how many different kinds of seashells exist even though tens of thousands of mollusks have been discovered and documented. Some seashells are as small as a grain of rice. Others are as big as a kitchen sink! 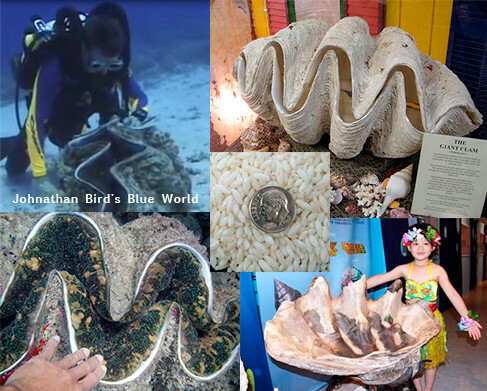 I have found both, the smallest hidden between grains of sand, and the largest, a giant clam shell, resting on the ocean floor in Fiji. Even half of this shell was so large and heavy, I couldn't bring it to the surface without the help of a friend, a rope, and a sailboat. Sadly, I couldn't bring it home. By the way, giant clams (Tridacna gigas), if left alone, can grow up to 3 feet wide. Seashells are formed by the animal which builds and expands this mobile home over time. Some seashells are created by the secretions of calcium carbonate and proteins from the animal's mantle, which envelopes the shell. Seashells can be univalve, meaning they are one solid shell such as a conch shell, or bivalve with two halves, such as the giant clam shell. One of the oldest seashell collections was found in the ruins of Pompeii and contained shells from distant shores. Most shelled sea creatures move around by using their 'feet' to cover a lot of ground, and some even tunnel below the sand as they forage for food. Giant clams, which are very heavy, can hunker down in one spot in the sand or anchor themselves on corals when they are small, staying put for a lifetime. Historically, seashells were used as currency, for jewelry, tools for carving and scraping, to bail canoes, as bowls and even as musical instruments. Seashells are collected and sold worldwide, but did you know that most of those perfect shiny seashells you find in shops are gathered alive and removed from their shells? 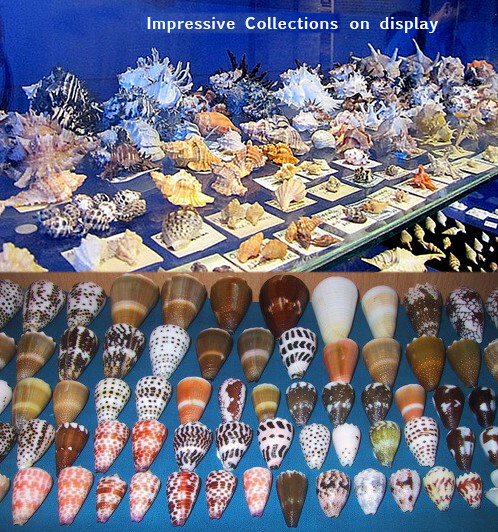 The seashell trade distributes shells from over 5000 species and some of these species are being depleted. Finding an empty seashell on a beach is a thrill and there are no strings attached. Some of these found treasures remind me exactly where I was when I found them, whether snorkeling or simply strolling on a remote stretch of beach. 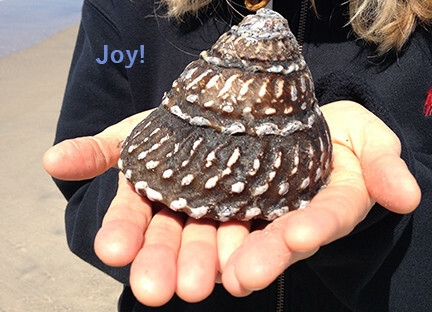 What gifts the sea gives us! For more information about seashells, check out Wikipedia here or check out this identification chart to see more beautiful shells. Or, just for fun, take a look at beach sand magnified 300 times! Beautiful! Reading a good book is one of life's many pleasures. I always have a book handy, whether I grabbed it from the library or found it via my e-reader. Quite often I have a book in my hands because my thoughtful husband chose one just for me when he was browsing the library shelves for his own leisure reading material. What do books have to do with painting, beside the fact that writing is definitely an art form? Emerald C Gallery owner Penny Rothschild and author Tamara Merrill put together an event at the Emerald C called Artists and Authors. The idea was that an artist would read one of the participating author's chosen books and create a piece of art depicting the story via a painting, sculpture, or other creation. The author would not see the art piece until the event, which happened this past Friday night (May 13) at Emerald C. 10 authors and 10 artists were on hand to speak briefly about their books and art pieces. I was the lucky artist to paint a picture for Tamara Merrill's book Family Lies! I met Tamara Merrill at an Emerald C Gallery event a year ago. Tamara is the author of Family Lies, the first book in a trilogy about a family dynasty filled with dysfunctional relationships, great wealth, and the lies that bind these things together or tear them apart. This is a fascinating read filled with high society gossip, real historical events, and interesting characters. I highly recommend it! 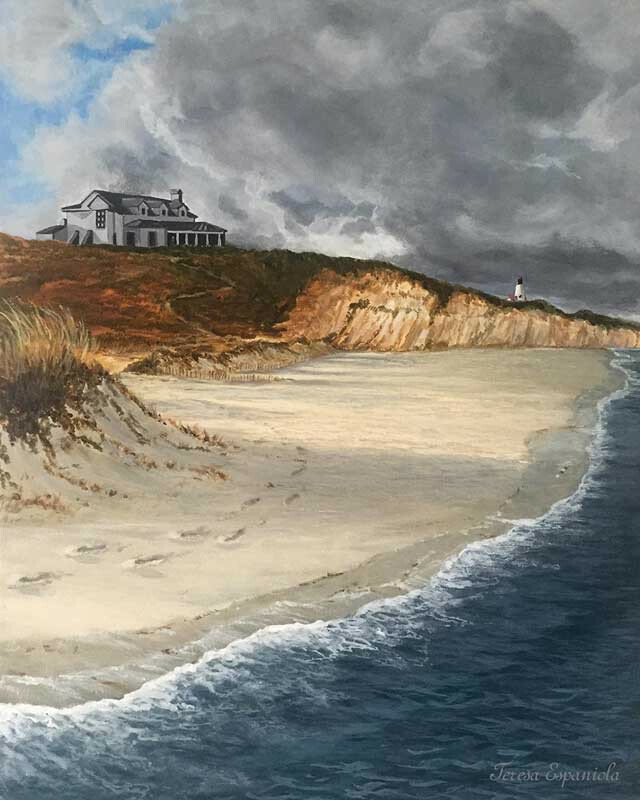 For Artists and Authors, I painted a scene of a stormy day on a wind-swept beach with a darkened home on the bluff. If you look closely, you can see someone standing on the covered deck. There are the footprints of someone else leading away from the path to the house. Because I usually paint images of bright days by the sea, this was a different and fun project -- I enjoyed it very much! Simon and Schuster recently grabbed Tamara's three books for publication. I am waiting for the release of volume 3 of the trilogy! You will find volume 1, Family Lies, and volume 2, Family Matters, on Amazon. Tamara is currently writing a new book with a completely different story line. I am hoping for another trilogy! Ever wonder why the sea foams? Apparently there are a lot of factors involved that cause the sea to foam, not all of them natural. Besides good ol' algae, seaweed, and other marine plant molecules of protein and fat, pollution particles also add to this briny foam. These particles contain detergents, sewage, fertilizers, chemicals, and run-off from factories which mix in with the plant molecules. According to experts, the final foaming factor is caused by molecules that have both a water attracting and a water repelling segment to their structure, and with the movement of winds and waves, this creates bubbles, which become foam. That was my very simplified non-scientific version. For a better and more in-depth explanation along with a few photos of a Scottish shoreline literally covered in sea foam, click here. I love how ocean foam frames the shoreline in sparkling white. Foam also shows the intent of a breaking wave which can be a very handy clue for a surfer choosing the best ride. 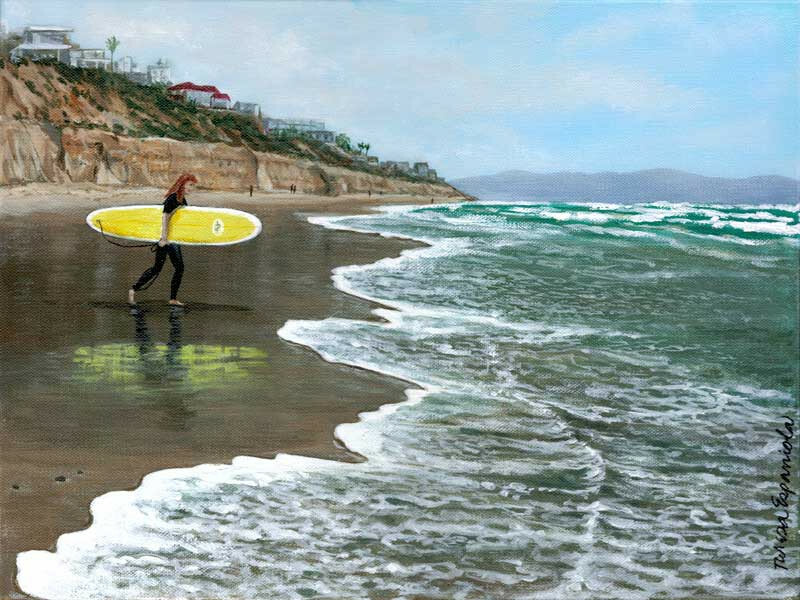 And, for me as an artist, how could I paint the seashore without whitewater? It would look so flat! 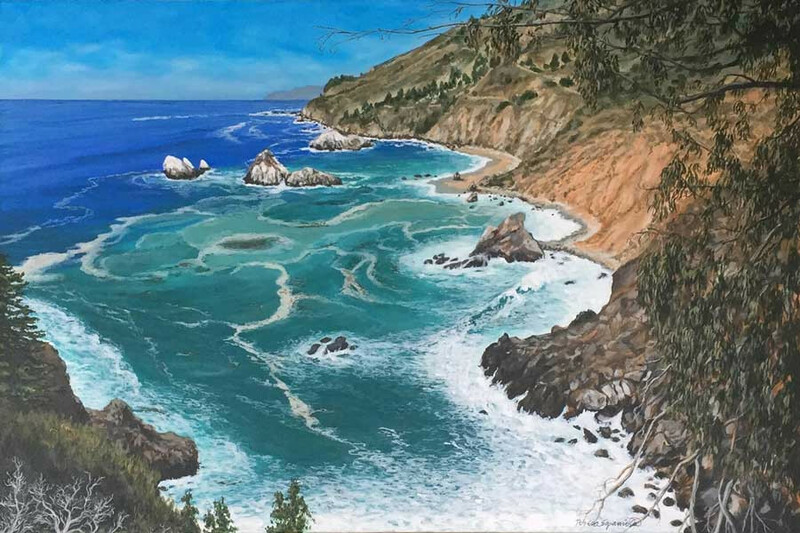 In this painting of a famous point in Big Sur, California, I chose to take up my paintbrush and depict the north view. 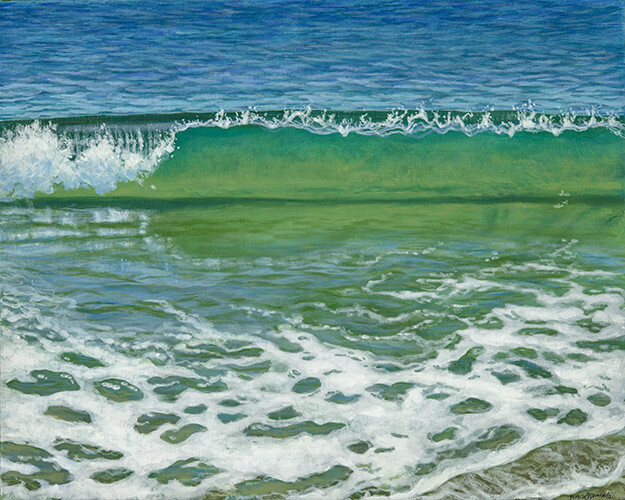 I love the colors of the ocean along this coastline, as waves and currents churn the water into swirling milky blues and greens, often outlined in foam. In the case of these particular coastal cliffs, the foam picks up a shade of pink from the red dirt that washes into the bay. If you drive through Big Sur, be sure to stop often at the roadside pullouts to gaze at the amazing views. What a beautiful world we live in. Painting is, for me, a solitary endeavor. The canvas sits on the easel in the usual spot and everything I need is within easy reach. However, I do have a companion of sorts: musicians and singers via internet radio. I have created about 20 stations from 80's music to sitar melodies, Hawaiian, Brazilian jazz, Adele and more. Sometimes I paint without listening to music, especially in the spring when the birds are singing. Who needs radio with birds in the neighborhood? When the sun comes up, birds are noisy with song. Coronado has a variety of birds from the common sparrow to wild green parrots that squawk as they fly in groups through the town. Crows are noisy and loud and can't really carry a tune, but I love them anyway. 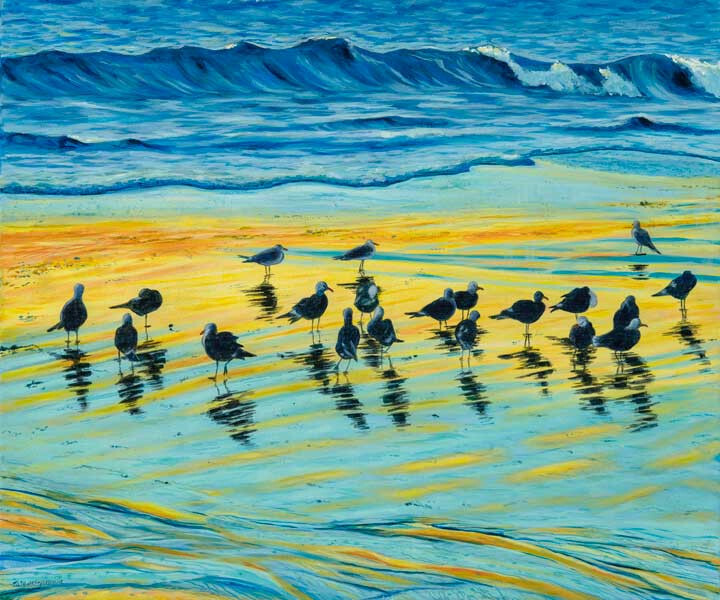 When I paint birds, they are usually sea birds, and though they are certainly noisy, they aren't big on singing either. I love them, too. The mockingbird takes the cake when it comes to singing! This bird can sing for hours, including solo concerts in the middle of the night! I found this YouTube video (7 min 45 sec) so you can hear what I recently heard at 3:00 am! Good thing they sing during the day, too. Here is another video (2 min 6 sec) of a singer on stage at the top of a tree. A friend of mine who is a fantastic artist told me she 'watches' movies while she creates, catching a glimpse of the screen here and there. When I searched on the internet, I found that artists, no matter what type of work they produce, often listen to music or something else, such as talk radio or a movie/TV program while they work. What do you like to do while you are creating a work of art? Being alone while I work is fine with me. I know it is the same for many artists. I don't mind my own company, with music or not. That said, as I write this, I am being serenaded by a mockingbird outside my window. Life is grand!